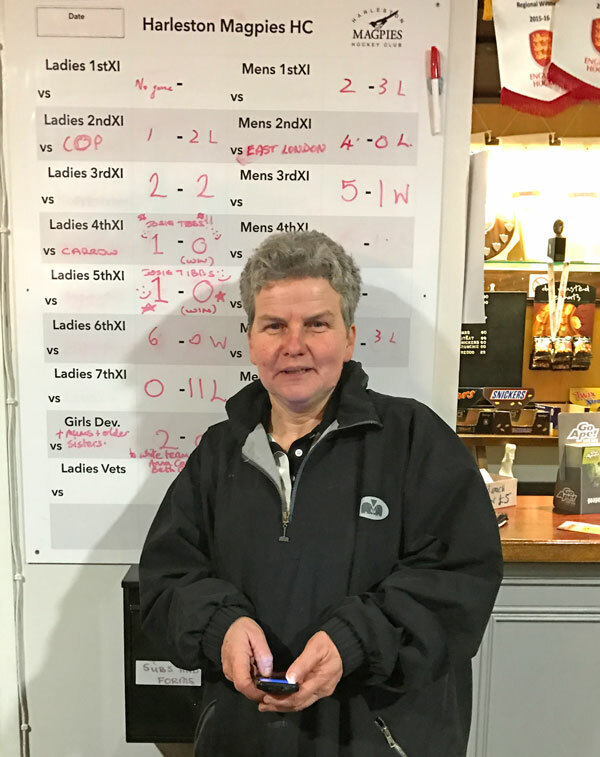 The club’s star player last weekend was undoubtedly 5th team captain (and club treasurer) Jose Tibbenham who not only played for her own team but also played for the 4ths (strictly within the rules) and scored the only goal of each game. She was also the MOTM of each game! Her first game was for a much-changed 4ths (due to illness) away to Carrow and her goal was created by Immi Meynell-Anderson (as she did the previous week for Anouska Stott’s vital goal) and her second game was at home for the 5ths against Watton 2nds. The goal came late in this game. Ellen Pope played well on her debut for the team while Alice Gooch made some good saves in goal. But even Jose would be hard pressed to double-up this coming Saturday as the 5ths are away to Thetford at 12.00 and the 4ths at home to Loddon at 1.45! Play got underway on Saturday at a thankfully frost-free Weybread with the Girls’ Development having a fun inter-club game involving twelve girls, three older sisters and seven mums with the mums, split between the teams, playing on the same side as their daughters. A repeat game has been suggested. Next into action were the Ladies’ 2nds looking to complete the double over fellow promotion hopefuls City of Peterborough who included ex-Magpie Mel Ludlam. Magpies dominated the early stages forcing several penalty corners but Peterborough were first to score following a right wing cross. As the game progressed Magpies deserved to be at least on level terms but they had to wait until ten minutes from the end for their equaliser when leading scorer Laura Tibbenham found the net at the left post. Magpies went looking for a second goal but with a minute to go Peterborough broke away for the winner. This Saturday Magpies are away to Bedford (2.30). Olivia Locke will hopefully be back playing again for the team in three weeks after unfortunately breaking a finger playing for the U18s in the national indoor finals. 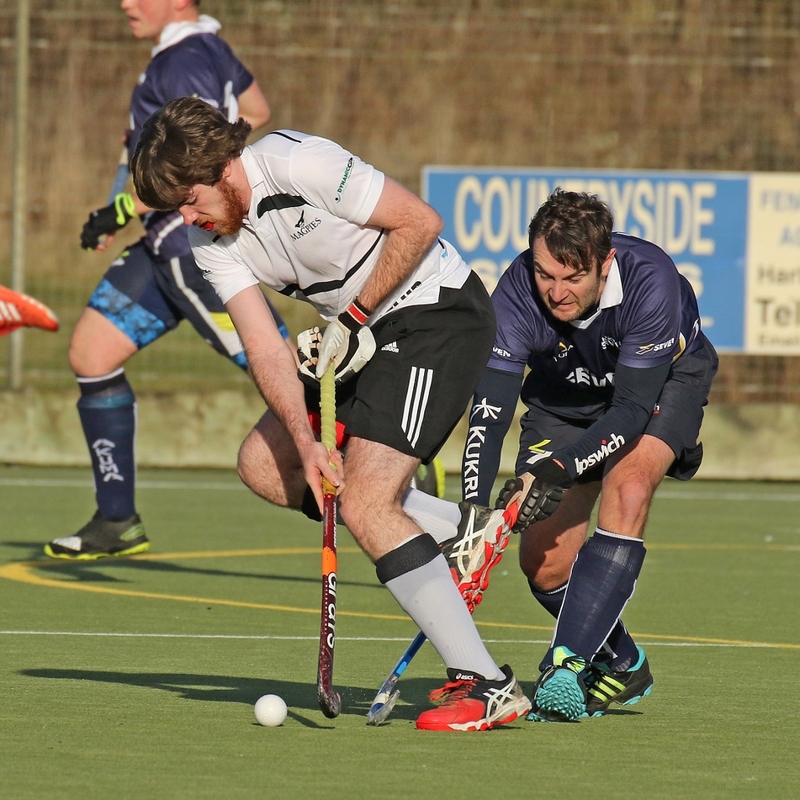 The Men’s 1sts then took on lowly Ipswich and they were ahead in the opening fifteen seconds (without Ipswich touching the ball) when Richard Larkin scored his first goal for the team from beyond a yard out and for the first time with a hit! Spurred on by ex-Magpies captain Mark Wheelhouse Ipswich were soon looking the better team but despite this Magpies were two up at half time following a penalty corner conversion by Ben Wright. Midway through the second half Ipswich scored three goals in five minutes to turn the game on its head. All three came from penalty corners with the first two fired low and hard inside the left post by Tom Dunnett (another ex-Magpie) and the third touched in at the left post by Josh Cutting. Magpies who were clearly lacking outdoor practice and missing six regulars (including one with a self-inflicted hand accident involving an axe!) responded with a host of penalty corners of their own including one on the final whistle. But Ipswich kept them all out for a deserved win. Magpies’ captain Leigh Sitch was as ever on top form at the back while Chris Leek made some good saves in goal on his outdoor debut. It was also good to see former vice-captain Pete Bale in the team. This Saturday Magpies are away to Chelmsford (2.00) who they beat 9-2 at home in October. You may have noticed that I have advertised this event before! We have now gratefully received a total of 44 ‘Promises’. The target is a minimum of 50 so we still have some way to go. Please see the club’s website for more information and for full details of the event including how to offer ‘Promises’ or items for auction. This is the club’s major fund raising event of the season. The outstanding home performance came from the Ladies’ 6ths who beat Watton 3rds 6-0. They were three up at half time through a brace from MOTM Vanessa Vigrass and captain Gillian Stokes’ first goal for the club. After the break the team continued to play their best hockey of the season with Vanessa scoring her third and Honey Lamdin adding two further goals in the last ten minutes. The Men’s 6ths lost 3-1 to Sudbury 3rds but the scoreline could have been much different had the team taken their chances after Pete Thornett equalised in the first half from a penalty corner. Murray Graham played well in goal while Graham Mobbs, Jack Largent and Ben Emms also had good games. Meanwhile Robbie Kinsella was playing for the 4ths – in their 2-0 win over Norwich Dragons 4ths –and bravely so he told me following his recent operation for the removal of kidney stones! Kieran Peters put them ahead with a penalty corner conversion but he was not so accurate with his next shot from near the penalty spot as the ball had to be retrieved from the car park by stand-in (and still injured) manager Bob Skinner! Toby Evers was enjoying a good debut having been welcomed to the club very recently. Alex Kilbourn made the game safe for Magpies, for whom Morgan Manly was in good form as right defender, in the second half with a neat reverse stick shot at a penalty corner. I was admonished by umpire Andy Smith (with a smile on his face?) for telling umpire John Pestell that he should have carded Dragon’s Jon Price for hitting the ball away at an infringement! Jon claims he was innocent! These have been announced and it is congratulations and best wishes to the following members who have progressed to the Bury St Edmunds centre via their county centres. U15 Boys – Michael Ahrens, Jude Pottruff, Hugo Thomas. U15 Girls – Georgie Cantrell, Keisha Hilaire. U17 Boys – George Baldwin, William Donsworth, Archie Winter. U17 Girls – Amy de Selincourt, Abby Gooderham, Martha Lawrence, Lauren Rowe, Lottie Summers, Rose Winter. Away from home there was a mixed bag of results for the club with wins for the Men’s 3rds and Boys’ Development, draws for the Ladies’ 3rds and Men’s 5ths and defeats for the Men’s 2nds and Ladies’ 7ths. The Men’s 3rds retained their league leadership with a 5-1 win over Norwich City 4ths. They were 3-0 up approaching half time through Greg Jagger, Vincent Leruth (looking sharp after his indoor season) and Tom Norton before City pulled a goal back. Chris Flatt on debut for the team in goal was forced into one good save before Vincent and Gavin Cole completed a competent win for a team still rusty after their 8-week break. Meanwhile the Boys’ Development consolidated their league leadership with a 7-0 win over Norwich Dragons ‘B’. Magpies were 6-0 up at half time after which Dragons strengthened their side with another adult and the Magpies manager Mark Emms tested out a few players in new positions. Scorers for Magpies, who gave a promising debut to Bruce Daniels, were Sam Emms 2, Ben Emms, Ben Waters 2 and Ollie Currie 2. The Ladies 3rds drew 2-2 with North Norfolk. Laura Betts equalised for them in the first half in open play before captain Sarah Legg made it 2-1 to Magpies at a penalty corner. The home team brought the scores level in the second half. With fifteen minutes to go Rachel Baynes took a tumble and very unfortunately has a fractured and dislocated wrist. Best wishes Rachel for a speedy recovery. Next on the pitch at Cromer were the Men’s 5ths who played out a 1-1 draw with North Norfolk 2nds. The home team took the lead four minutes from time before two minutes later Andy Caston was on hand after shots by Jude Pottruff and son Jake were saved. There was still time for Jude to be denied the winner by a good goal line save. Steve Halliley was in outstanding form for Magpies in goal. The Men’s 2nds went down 4-0 to East London on the main Olympic legacy pitch at Lee Valley. In a good spirited game Jonty Herschel-Shorland was on top form while the team was delighted to welcome back Martin Fields after illness. Please see the website for the entertaining report of the game. The Ladies’ 7ths came second to Hornets! The club is through to the second round of England Hockey’s Mixed Trophy after our team’s excellent 2-1 away win last Sunday over Bedford 2-1 with both goals scored in the first half by Laura Tibbenham. In a recent edition of The Hockey Paper Tina Cullen MBE includes Kath in her Dream Team and she says “Nothing got past Kath, she was an unbelievable tackler. The opposition called her ‘The Wolf’ because they thought she was really scary but she was the nicest person you could ever meet”. Well said Tina. Julian and Philippa Taylor. It was an excellent evening in delightful surroundings. The club’s bar steward and O50s star Simon Bardwell is providing chilli and rice in the clubhouse for those who wish to watch this game. You will be very welcome – charge £2 on the day. Good luck as always to all our teams this coming weekend including on Saturday the Ladies’ 1sts –after their 1-0 (Maria Andrews) warm-up win over St Albans last Sunday – who will be in outdoor league action for the first time since 26 November when they travel to play Northampton Saints. On Sunday the Ladies’ O35s and U14 Girls will be in home action while the U16 Girls and U14 Boys will be playing away. Please see the Latest News page of the website for the complete list of fixtures including times.